House Speaker, Dr. Barton Scotland. House Speaker, Barton Scotland on Friday condemned strongly the waving of placards and heckling of President David Granger by opposition People’s Progressive Party parliamentarians while he was addressing the Parliament earlier this month. Dr. Scotland said despite the use of of pamphlets, and other bits of paper, some of them bearing poor spelling and even poor grammar, without his permission, he was not baited into stopping them to create a deeper problem and prevent the President from delivering his address. “It seems as though those members were, by their conduct, were inviting the intervention of the Speaker in order no doubt to acquire for themselves a new opportunity at bedlam. The Speaker, Honourable Members, remained oblivious to the invitation. If the intention was to prevent the delivery by His Excellency, the President of his message to Parliament, then I must say to all Honourable Members then the purpose for which the 71st sitting of of our National Assembly was called was fulfilled,” he said without mentioning whether government or opposition parliamentarians had disturbed the House. Calling the PPP MPs actions “exceptional parliamentary misconduct,” the House Speaker said the “inexcusable and irredeemable performance” amounted to disrespect for Guyana. “The presence of His Excellency the President, Honourable Members, in the National Assembly is an occasion for signally remarking the event of his presence in the House. It is an occasion on which Guyanese, who are members of the National Assembly, should gather to demonstrate to the State of Guyana and the personification of the State through the presence of His Excellency, the President,” Scotland said. He did not announce any sanctions against the offending parliamentarians but noted that the Standing Orders were violated because no approval was sought or granted for placards to be used in the House. Scotland contended that calls for democracy and free speech, as were stated on the placards, were “supremely ironic”. 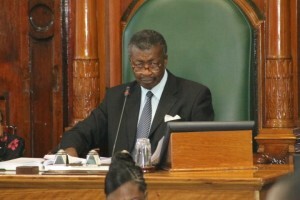 The Speaker noted that House was now being faced with a new paradigm for conducting business, although the rules protect the rights of all members to speak, hear and to be heard. “This National Assembly allows for views and competing views to be expressed vigorously, even passionately by all Honourable members,” he said. The virtues of the House, he said, now appeared to be under attack. “The display showed by some Honourable members of this House was both intemperate and misguided at the 71st Sitting. Let it be recorded that this House strongly deprecates the conduct shown by some Honourable members on that occasion,” he said. Opposition Leader, Bharrat Jagdeo has said that his party does not respect the President. The PPP has launched a campaign of disobedience against the APNU+AFC government ever since President Granger refused to pick one of Jagdeo’s 18 nominees for the post of Guyana Elections Commission Chairman, and instead unilaterally appointed Retired Justice James Patterson.